Want to change your lighting options at home but don’t know where to start? Try small table lamps. Modern table lamps are fun, funky, and useful. Despite what their diminutive stature may suggest, table lamps can change a dull room into a bright and exciting one. They can also add color and interest at a design level. Modern table lamps offer a myriad of styles and designs that are a far cry from the dusty old table lamps of yesteryear. A practical choice, having small table lamps in the master bedroom and in guest rooms means that no one will have to drag themselves out of bed to turn off a light once they’re finished reading. Not only that, contemporary table lamps give you another option when it comes to lighting. If, for example, you’re watching TV and the ceiling light is too bright, you can turn off the main light, turn on your lamp and watch your show without having to sit in bright, unrestful light. Whether it's a funky table lamp you're looking for or perhaps table lamps for living rooms, our collection of table lamps is sure to have the right one for your home. Material - Table lamps can be made from a huge variety of materials like wood, resin, ceramic, brass, glass and marble. If you’re looking for something sturdy, choose a tough material that’s durable. If toughness isn’t a concern, pick whichever material complements and lifts your existing decor. Size - Nightstand lamps are often placed on each side of your bed on your nightstands. The size of your nightstand will determine the size of the lamp. Nightstand lamps are usually small and make good choices for other areas of your home too. Whichever kind of small lamp you get, do make sure that its base will be able to rest comfortably on the surface you have available for it. Color - As always, colors should complement each other. The color of your table lamp and home decor should be in sync with each other. This doesn’t mean that they should match. Or be the same color in different shades. In fact, contrasting colors, such as orange and gray, usually complement each other well. Complementary color schemes bring a sense of cohesion to a room. 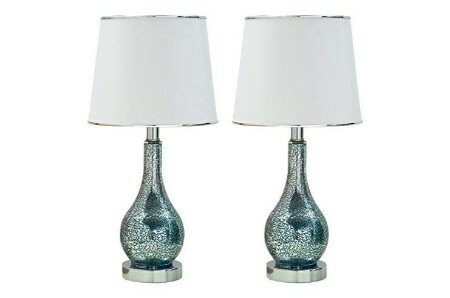 Style - Contemporary table lamps often come in pairs, one for each side of the bed. It isn't compulsory to choose the same lamps for your bedside tables though. 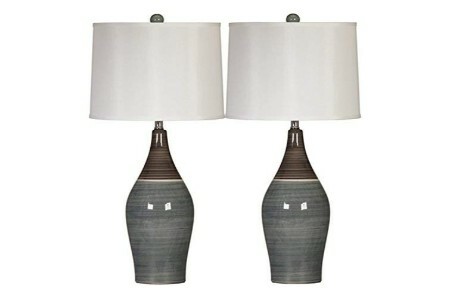 You can decide to be a little quirky and take two different lamps that are coordinated in regard to design and color. Just make sure you match the style of the lamp to the design style of your room. Check out this multicolored/gray ceramic table lamp, manufactured by: Signature Design by Ashley, a delightful home décor design piece. Made with first-class ceramic, size 15x15x28. Now on limited time discounts for modern table lamp. Black leather table lamp, by Elegant Designs, model: LT1025-BLK. Material: the finest leather, the best deal for fine table lamp, a superb living room masterpiece, dimensions 10x6x21. Check out this minimalist table lamp, a really unique lamp! Bronze metal table lamp, brand: Globe Electric, model: 12398. Made with fine metal, the best deal for fabulous table lamp, dimensions: 13x13x27. Add a splash of color to your day with this transitional table lamp, incredibly cool! If you are a fan of art you will love this white fabric table lamp, produced by Kings Brand Furniture, amazing living room artistic accessory. Made of fabric, dimensions 10x20. This top notch nautical table lamp, incredibly cool! 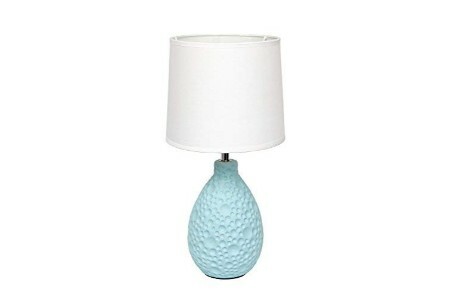 Bue ceramic table lamp, produced by Simple Designs Home, model: LT2003-BLU. Made with top-notch ceramic, best price for elegant table lamp, surprising home décor fashionable piece, size 7.09x7.09x14.17. A perfect work of art! If you are a fan of art you will love this brown metal table lamp, manufactured by: Franklin Iron Works, amazing bedroom classic accessory. Material: metal, size - 28". Least expensive cost for retro style table lamp, a must try! Classy brown wood table lamp, brand: Regency Hill, model: JD11062-2PK. Made of supreme wood, get the best price with this bergain sublime table lamp, a beautiful living room upgrade piece, size 30". The best seller 50's table lamp, enjoy! 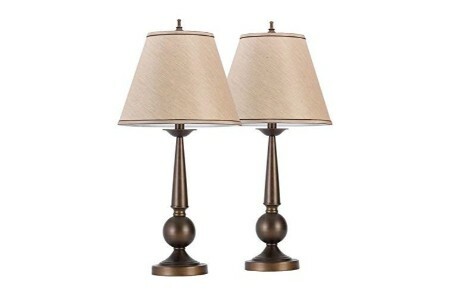 Brown metal table lamp, brand: Regency Hill, model: TT052203. Made with the finest metal, this item received the best reviews for modern table lamp, a superb home décor masterpiece, size 25". Incredibly cool and for a reasonable price. Make your friends' jaws drop with this black metal table lamp, by: HAITRAL, must have bedroom enhancement piece. Made of top-notch metal, dimensions 17x10x10. Low cost modern table lamp, also makes for a really unique décor piece! 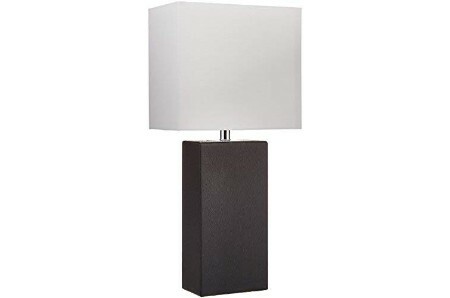 Black metal table lamp, made by Simple Designs Home, model: LD1036-BLK. Made of excellent metal, low cost modern table lamp, a delightful living room layout accessory, size 7.5x5.88x18.75. Premium vintage table lamp, marvelous decor idea! Incredibly cool, this amazing silver brushed steel table lamp, manufactured by Regency Hill, a wonderful home décor artistic accessory. Material: fine brushed steel, size: 25". Best price for minimalist table lamp, a must try! Get ready for the best bronze finish metal table lamp, created by Signature Design by Ashley, a radiant bedroom adornment. made with excellent metal, dimensions: 14.13x14.13x29. Top of the line vintage table lamp, amusing to utilize! The best-selling bronze wood table lamp, produced by Surpars House, amazing living room stylish accessory. Made of top-notch wood, dimensions 5.51x5.51x13.78. Top of the line nautical table lamp, super fun and for a reasonable price. Nostalgia is back with this silver glass table lamp, created by Catalina Lighting, upgrades your style, amazing home décor elegant piece. Material: glass, dimensions 14x14x24. Top of the line modern table lamp, incredibly fun and stylish! Finally this epic polished nickel ceramic and fabric table lamp, made by Stone & Beam, a sublime bedroom fine accessory. Material: excellent ceramic and fabric, size: 13x13x25. Discounted retro style table lamp, an ideal show-stopper! Blue glass table lamp, made by: Regency Hill, model: TT150625. Made with fine glass, this is the best price for 50's table lamp, a beautiful living room adornment, size 25". If you want to add a touch of style you need this 50's table lamp. Yellow glass table lamp, produced by Home Source Industries, model: LMP106. Made with the very best glass, the best deal for stylish table lamp, a wonderful home décor accessory, dimensions 12x12x24.5. Premium 70's table lamp, incredibly cool! Finally the best gray wood table lamp, brand: Signature Design by Ashley, nostalgic bedroom enhancement piece. Made of first-class wood, size 13.25x13.25x27.5. On sale, the best modern table lamp, this will put a smile on your face in the morning. Brushed nickel fabric table lamp, brand: Kings Brand Furniture, model: L821. Made with fabric, top of the line creative table lamp, amazing living room masterpiece, size: 10x10x18.75. The highest quality vintage table lamp, a great masterpiece. The astonishing best seller bronze metal table lamp, manufactured by Lightaccents, a superb home décor stylish accessory. Material: fine metal, dimensions 11x11x18.5. On sale, the best 70's table lamp, and beautiful! Innovative marble, brass, metal and fabric table lamp, manufactured by Rivet, model: ALT17032508. Now on limited time discounts, a heavenly bedroom design piece, size: 6.5x13.5x17. The super best modern table lamp, it sure is gorgeous. If you are a fan of art you will love this white metal table lamp, manufactured by: Simple Designs Home, a beautiful living room elegant piece. Material: supreme metal, dimensions 4.88x4.88x10. Best savings for retro table lamp, a must try! This is one of the coolest black metal table lamp, by SOTTAE, nostalgic home décor brilliant masterpiece. Made of supreme metal, size 9.06x9.06x15.75. This item received the best reviews for vintage table lamp, an exceptionally one of a kind! Silver glass table lamp, produced by 360 Lighting, model: TT17041801. Made of supreme glass, top of the line jewel table lamp, an extraordinary bedroom stylish accessory, size 21.75". Buy it now, the best 70's table lamp. Who would have thought that as unassuming an item as table lamps could be so useful when it comes to interior design? Unique table lamps are a fantastic and affordable way to boost your style game ‍and add personality to your rooms. Not only that; because table lamps are practical items, you’ll have more options when it comes to creating a relaxing and atmospheric lighting system. Table lamps are generally inexpensive, hard-wearing, and many are easily updated with a lick of paint or a replacement shade. Choose a table lamp with a long stem or an interesting design detail to create height and visual interest on your tables. If you’re feeling bold, choose a bright, unexpected color such as primary blue. Don’t throw out that old lamp. Instead, replace an old shade’s fabric with a modern print. Anything retro-patterned or featuring geometric shapes ‍is very popular right now. This look works well in contemporary and mid-century modern styled homes. Color matters, so choose lamps and shade in a color that will complement and add to your existing color scheme. Alternatively, go for a bright and striking statement color. Consider your fabrics if you’re using shades. If you want to create a soft glow in a dark room, try a heavy muslin or calico shade in a natural tan color. Mix and match sizes. Juxtaposing a tall table lamp with a shorter, more stout lamp will create eye-catching visual appeal. Mix and match bases and shade. Got an old, retro-looking base that you don’t know what to do with anymore? Try topping it with a modern and edgy shade. Table lamps aren’t just for tables or nightstands. Try placing one on your windowsill at night to create an ambient glow. They also work well in bathrooms providing soft, diffuse light. Make your friends' jaws drop with this black wood end table, produced by Convenience Concepts, a delightful home décor classic accessory. Material: the finest wood, size: 24x16x24. Buy it now top rated for retro end table, tremendous! If you want to add a touch of style you need this black wood end table, manufactured by Crown Mark, a must have home décor adornment. Made of wood, dimensions: 24x12x24. Save money with this end table, looks absolutely amazing! Black wood floor lamp, manufactured by Brightech, model: MAXWELL-LED-BK. Made of excellent wood, this is the best price for a floor lamp, a must have living room design piece, size: 10.25x10.25x63. Retro floor lamp, a very unique décor piece . Tasteful glass candle holder, manufactured by Dawhud Direct, model: DH-549. Made with high quality glass, best price for elegant candle holder, a delightful home décor classic accessory, size: 5.4x3.9x10.7. What's not to love? a unique deocr item. Brilliant world famous canvas wall art, by: wall26, model: CVS-FP-0118-36x24x1.50. Material: canvas, this is the best price for innovative canvas wall art, size 24x36. Add a splash of color to your day with this modern canvas wall art. Creative black metal end table, by Signature Design by Ashley, model: T233-2. Made of the finest metal, best price for stylish end table, dimensions 24.13x24.13x23.75. This simple and understated design is the best modern end table.